An ovation at the Minster for songwriter’s tribute to Lillian Bilocca & Hull’s Triple Trawler Disaster. The power of Triple Trawler Disaster song cycle 12 Silk Handkerchiefs by radical songwriter Reg Meuross brings a community to its feet, writes Katie Whitehouse from Reg Meuross Music. More than 400 people in Hull Minster gave a standing ovation for the song cycle 12 Silk Handkerchiefs by acclaimed singer/songwriter Reg Meuross. Extra seating had to be provided for the many from the Hessle Road fishing community who walked in on the night. 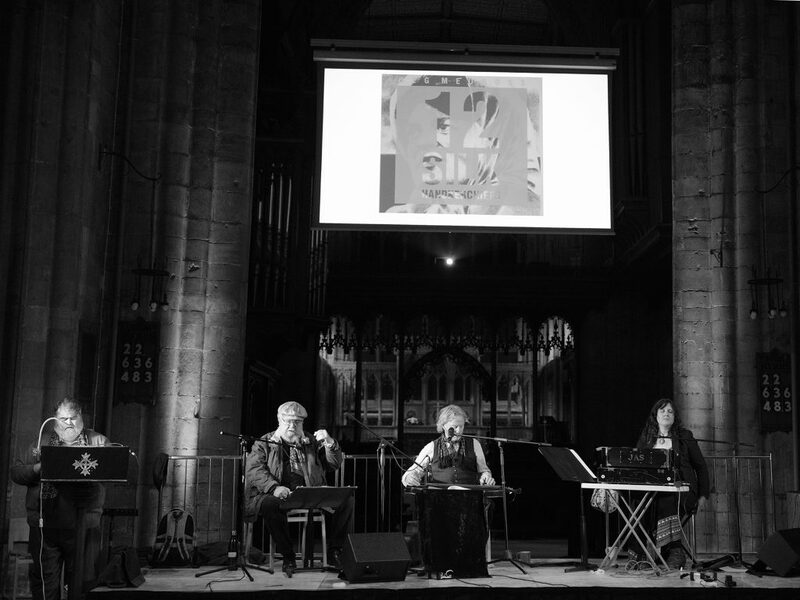 The music which tells of fighting fishwife Lillian Bilocca, who led a battle for better trawler safety following the Triple Trawler Disaster of 1968, was at the heart of a multi-media show in the Minster on November 8. Former Deputy Prime Minister Lord John Prescott, who campaigned with Mrs Bilocca when he was a young trade unionist led the tribute that brought hundreds to their feet. The songs were inspired by the book, The Headscarf Revolutionaries by Brian W Lavery, who curated and narrated the sell-out show. The book’s title is now shorthand for the four women Lillian Bilocca, Mary Denness, Yvonne Blenkinsop and Christine Jensen MBE (formerly Smallbone) who fought the trawler bosses in a campaign which ended in Westminster. Reg was joined by Hull musicians Sam Martyn and Mick McGarry to tell the story to an audience that included last-surviving Headscarf Revolutionary Mrs Yvonne Blenkinsop. The show also covered a fourth tragedy telling how Lillian Bilocca was ostracised by her community and overlooked by history, ending her days in obscurity. The show’s title comes from Lil’s last action in 1988 as she lay dying, which was to send her daughter Virginia to buy a dozen handkerchiefs to give as gifts to those who had cared for her in hospital. The audience also had relatives of the three other women who battled for better safety at sea after three Hull trawlers, the St Romanus, the Kingston Peridot and the Ross Cleveland perished in as many weeks in what became known as the Dark Winter in which 58 men died. The show had rarely-seen archive footage, photos and audio of Harry Eddom, the disaster’s sole survivor and mate of the Ross Cleveland. Hundreds from Hessle Road’s fishing community sat alongside relatives of the Headscarf Revolutionaries and of those lost in the tragedy. They were overwhelmed by the power of the show, with many in tears. Yvonne Blenkinsop, was joined in the front row by Ernie Bilocca and Minnie King, the son and sister respectively of Lillian Bilocca, and Lorna and Alex, the daughter and grandson respectively of Mary Denness. One hundred members of Hull Unison joined with the community in the packed out Hull Minster, with the Lord Mayor Councillor Peter Allen, accompanied by John Prescott. This story which was overlooked until for many years The Headscarf Revolutionaries was published, unfolded in a powerful narration from author and journalist and academic Dr Brian W Lavery, an authority on the trawling industry, whose book inspired the songs. The Lord Mayor, who knew Lillian Bilocca said: “On Saturday I attended the Hull Minster to see the showing of 12 Silk Handkerchiefs which told, in a narrative and music, the battles of Big Lil in fighting for Jujtice for the fishermen and the way she was finally treated at the end of her life. “From the narrative of Brian Lavery to the musical prowess of the three Musicians it must have made everyone think of how Big Lil should have been treated and I’m sure would be treated if we were all given a second chance. Singer Mick McGarry, a lifelong union activist and doyen of the city’s music scene said: “It was a moving and humbling experience for me to be asked to be part of this. “I really enjoyed working with such talented people as Reg, Brian and Sam. “Reg’s ability to weave the story from Brian’s book into such powerful songs is fantastic. “Brian’s presence and skillful delivery of this very emotional story made him the perfect narrator. “As a singer myself it was an absolute joy to work with Sam, in my opinion one of the finest singers on the folk music scene. 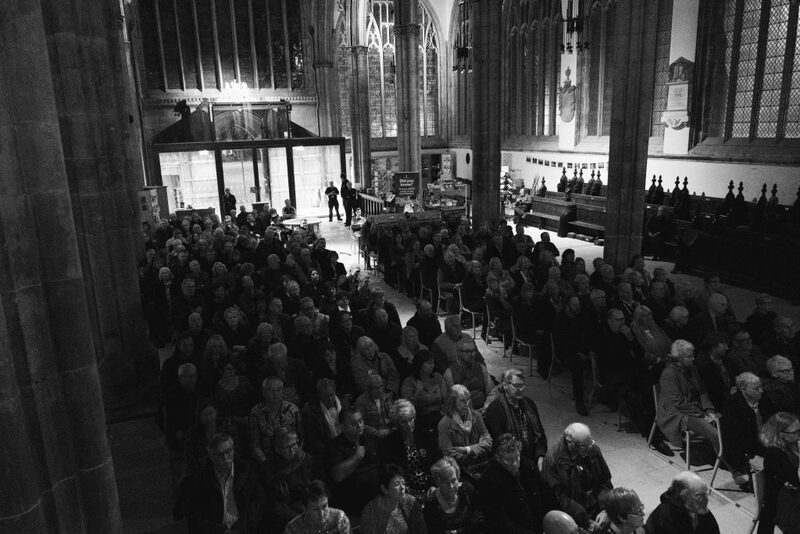 Multi-instrumentalist and vocalist Sam Martyn said: “The Hull Minster concert was one of the most special projects I’ve ever had the privilege to be a part of and the memory of it will stay with me forever. “Just the chance to work with Reg, one of this country’s finest singer-songwriters, was in itself amazing, but performing in front of the very people our show was about was something else. “As I saw them take their seats in the front row, I realised even more how much this matters to them, and how we had a responsibility to do their story justice. “And that standing ovation… that’s when it hit home that we had done them justice and there wasn’t a dry eye on stage or in the audience. Brian added: “Reg Meuross tells a story as only he can with beautifully crafted lyrics and melodies that touch the soul. “If a picture is worth a thousand words, then a Meuross song must be worth so much more. What started as a performance ended as a heartfelt remembrance and tribute from audience and artists alike, not only for the 58 fishermen who perished in 1968 to the 6,000 souls who sailed from Hull never to return to this tight-knit community on the north east coast of England. The show is touring, and will hopefully return to Hull in 2019. Be the first to comment on "An ovation at the Minster for songwriter’s tribute to Lillian Bilocca & Hull’s Triple Trawler Disaster."